The countdown of the "Top Ten Most Fascinating Artifacts in the Hall of Space Museum" begins with the Lunasphere from the Soviet Union. When I decided to do a top ten list, I thought it might be a good idea to seek input from my fellow Cosmosphere employees. So, I sent out a little email to twenty people asking for their top ten. When I dissected the responses, I had 45 different artifacts on the various lists. It was obvious to me that this approach would not work. In the end, the list is mine and you are free to argue with it or agree wholeheartedly. I would prefer the latter of course. Once in awhile a seemingly onerous task brings unexpected clarity. I constantly talk and write about our numerous summer camp programs. There are thirteen distinctly different camps residing under the banner of Kansas Adventures in Outer Space and I was assigned the task of explaining our educational philosophy in 150 words. Here they are. The Cosmosphere’s mission is to preserve the past and inspire the future of space exploration. 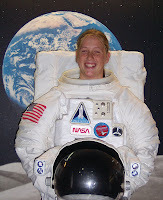 We approach teaching about space as fun with a purpose. We strive to make learning exciting and unavoidable. Our students tend to have a sharp eye to the future. Some have not enjoyed the usual avenues of acclaim and success found in conventional environments. We create obstacle filled, immersive, space based scenarios that encourage students to forge creative team based ways to overcome them. We believe in the power of cooperation and the motivational force of competition and creatively weave both into the fabric of our challenges. Our campers often encounter other serious minded people like themselves. More often than not, they flower. Our goal in all of our programs is for our students to discover the hidden pool of potential within themselves and for them to begin to wield that potential in positive ways. Don't trouble yourself. It is exactly 150 words. I'm kind of funny that way. Sounds like a great place to send your kids this summer. Once upon a time the most put upon man in the world was forced to write a weekly blog. Sometimes the best thing you can do is pull some old thing off the shelf or out of a drawer, dust it off and run it by again. Sometimes, it’s the worst thing you can do. Back in 2009 I did a series of short videos called “History in 90 Seconds”. They were somewhat less than a hit, but I thought they were good, so here they are again. Episode One dealt with why the Cosmosphere is in Hutchinson. Meredith is doing that right now in our 50th anniversary year, so I will leave that to her. Please, judge me, but not too harshly. Why is there a space museum in Kansas? Why Hutchinson? These are two of the big questions we get asked here at the Kansas Cosmosphere and Space Center. People from all over the world come to visit our museum and are surprised to find such treasures in the Heartland of America. I don’t think I have ever been surprised myself about it, as growing up in Hutchinson it was ‘the norm.’ I will say I am impressed by the Cosmosphere. We have a supportive community of friends and museums who help us to maintain our stature as one of the premiere space museums in the world. Yet again you ask, why Hutchinson? It’s quite simple: someone had a dream. Fifty years ago this year, Patricia “Patty” Brooks Carey started the Hutchinson Planetarium. The only planetarium in the state of Kansas at the time made its debut in the old chicken coop on the State Fairgrounds. Patty had a love for astronomy. 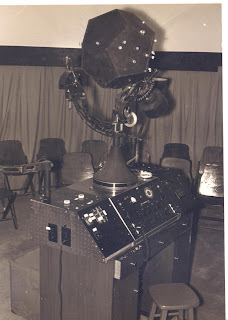 This love of the stars is one of the reasons the Hutchinson Planetarium was created. In a single weekend, Patty gathered the finances from her community friends and neighbors to finance the purchase of a star ball. The first show, “Star of Bethlehem” opened December 2, 1962. 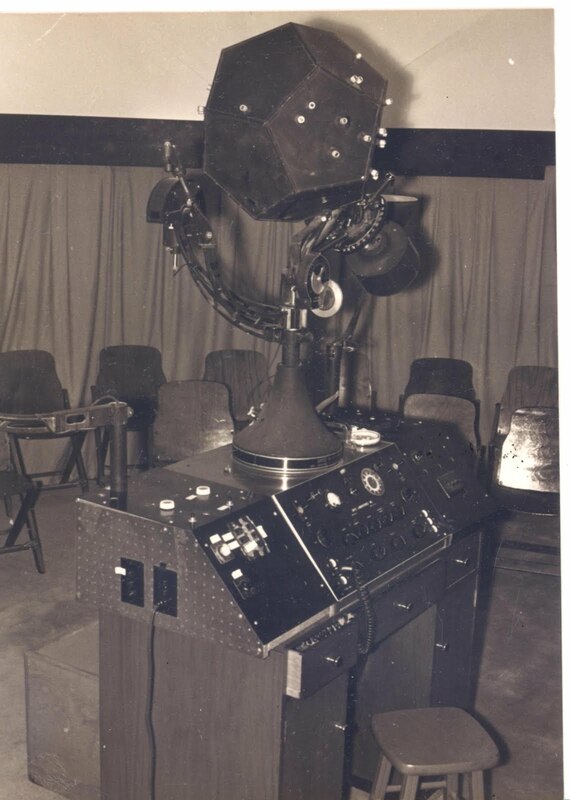 As the years went on, the Hutchinson Planetarium expanded and was relocated to the Cosmosphere’s current site at the Hutchinson Community College. In the 1980s, the Kansas Cosmosphere and Discovery Center maintained the Planetarium and other learning oddities, such as an Egyptian mummy and a real live snake! With Patty Carey leading the way and placing the right people in position, the Cosmosphere began to collect more and more space artifacts. The Kansas Cosmosphere and Space Center now houses one of the most comprehensive space artifact collections in the world. Recently, I had the pleasure to sit down with one of Patty’s family members and take a stroll down memory lane. We were looking at old photographs and albums of Patty, which encompassed a large amount of Cosmosphere history. Patty was a world traveler by the age of ten. Astronomy was not her only love; she had a passion for history, the world, and public service. I was amazed at everything Patty Carey did in her lifetime. Her title as “Executive Mom” for the Cosmosphere was one of her most cherished roles. 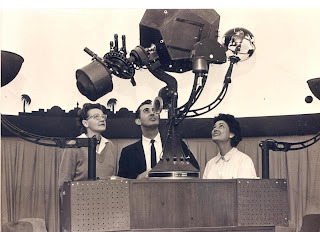 In this 50th anniversary year of the Cosmosphere’s beginning, I hope to share with you all not only the Cosmosphere’s story, but Patty Carey’s story. Even more, though, I hope you all share back with us your stories and remembrances of Patty Carey and experiences at the Cosmosphere over the years. Stay tuned! In the weeks to come, you’ll learn just how an Egyptian mummy became part of our past! Once upon a time the most put upon man in the world was forced to write a weekly blog. He pointed out that he was an expert at nothing, that in fact; he despised experts in general and therefore was not at all qualified to write about anything. His arguments fell on deaf ears. So, it came to pass that I, the he referred to above, became The Reluctant Blogger. Experts in my opinion, come in five distinct types. This expert knows their subject, their limitations and their place. They are as rare as hummingbirds in Antarctica. This expert knows a lot about one or several topics. More often then not they come to believe themselves experts on all topics, resulting in a stoppage of both listening and learning. This expert knows everything about a specific narrow topic, speaking only of their beloved. This expert is an expert in name only. They know almost nothing about their topic, but sputter and bluster as if they do. This is me. I work in a space museum. I can think of few fields of expertise filled with greater uncertainty than space and history, and I am immersed in both. My museum is called The Kansas Cosmosphere and Space Center. It is in Hutchinson, KS, and is, in my opinion, the greatest space museum on earth, and one of the world’s great museums, period. Bold statements, but I intend to prove them true. The good news is that this is my dilemma and not yours. I will share with you the wonders of the Cosmosphere’s Hall of Space Museum and encourage you to decide if my boasts are true.